To produce high quality corrugated paper, paper plants can use virgin pulp, waste paper(LOCC, AOCC and OCC) as raw materials.According to the 150 t/d corrugated paper manufacturing project, Leizhan professional engineers developed the following design. Machines required in the pulp making system contains: chain conveyor, D type hydrapulper, cleaner( high density cleaner, middle density cleaner, low density cleaner, etc. ), screener ( mid consistency coarse screen,1st stage fine screen, 2nd stage fine screen, inflow pressure screen, etc. ), separator(fiber separator, reject separator, etc.) and refiner( double disc refiner, claflin refiner, conical refiner, etc.). 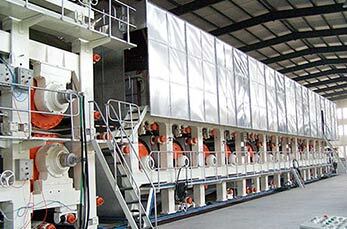 The trimmed width of Leizhan high quality corrugated paper machine range from 1570mm to 5800mm. It can produce 12-500 tons of fine corrugated paper per day by using commercial wood pulp and waster paper as raw materials. Leizhan paper production machine has a basis weight of 60-150g/m2 and the operating speed of fluting paper machine is 100-800m/min.